The dollar is taking a beating. America seems to be losing its primacy in the world. Even if the economic picture seems bleak, there is such concepts as dignity and pride. Our President seems to apologise at every occasion for America's misdeeds. Now the last shred of America's dignity has been tossed by President Obama like a cheap undergarment being cast aside by a budget stripper. The London Telegraph reports as follows on the newest low in our President's total shamelessness. "President Barack Obama has refused to meet the Dalai Lama in Washington this week in a move to curry favour with the Chinese. "Today, economic interests are much greater than other interests," he said. " There is no difference at all between what China is doing in Tibet and what the USSR did in Latvia Lithuania and Estonia. After invading the Baltic nations, The Soviet Union tried to settle in as many ethnic Russians as possible, thereby making Soviet annexation of the Baltics a demographic as well as a political fait accompli. Since 1958, when Tibet was annexed, successive Presidential administrations have expressed the disgust of most Americans at China's aggression against a peaceful neighbour. Samdhong Rinpoche, Tibetan Prime Minister in exile really said all there is to say . "Today, economic interests are much greater than other interests." For every time Obama has presumed to apologise for America, millions of Americans have wanted to apologise for our President. 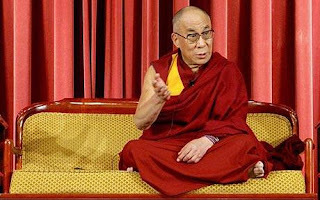 Many of Obama's supporters who are inclined towards Eastern religions will be very dismayed at his rebuff of the Dalai Lama who has spoken with quiet eloquence and without a teleprompter for the independence of his homeland. During the Bush Presidency, Bush was denounced before a British audience by the Dixie Chicks. I wonder how many bands today would like to repudiate our spineless President. Under President Obama, what does America stand for? Just about anything, I guess. China is the next world power..hell yeah keep them happy Obama!